Booty Bucket Knit Kit Gift Set - This kit contains all you need to knit an ultra soft set of baby booties in Plymouths Angora Yarn for those special, teeny, twinkly toes! 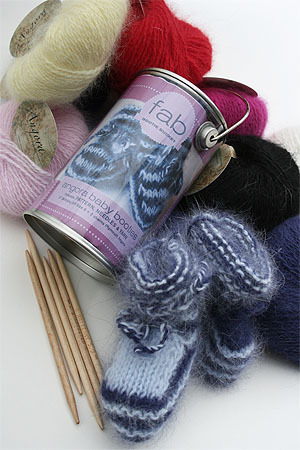 Angora Baby Booties Knit Kit in our fab gift bucket features Plymouth Angora, Pattern and needles! (Finished booties shown are what you make with the kit - yarn color featured in made up booties is the Little Boy Blue Combo! We never imagined our baby booty pattern would be so incredibly popular - downloaded by over 2 thousand people - this pattern is SO easy to knit that even beginners have fun. This kit starts them off - whether they are expecting, have someone close who is expecting - great for baby showers, or stocking stuffers. Everything you need comes in the bucket - 2 skeins of the softest angora, the pattern, and needles. In a cute, handy-dandy gift tin!